Fromagerie La Station in Compton, Quebec, is a family-owned farm providing consumers with organic cheese, organic vegetables, and maple syrup. Their award-winning cheeses are made using an organic and sustainable process and their cows graze freely in an organic pasture. The company has recently received Canadian government funding for dairy processing equipment. Fromagerie La Station has been awarded $910,355 in agriculture business grants from the Dairy Processing Investment Fund (DPIF). The Dairy Processing Investment Fund (DPIF) is a four-year (2017-2021) Canadian government grant program providing funding to dairy processors who invest in areas that improve competitiveness and productivity, such as technology adoption projects. Agriculture funding for Fromagerie La Station will allow the company to increase their production capacity, expand operations, and meet the growing demand for locally-produced ripened cheeses. Fromagerie La Station specializes in four types of cheese, all that are certified organic: Chemin Hatley Alfred, Comtomme, Le Fermier, and a raclette cheese. The company has received multiple awards, both nationally and internationally. Some of these include top prizes at the World Cheese Awards in London, England and the Canadian Cheese Awards in Toronto, Ontario. The organic cheese processor has received nearly $1M in agriculture funding, which will help them increase production and bring more high quality cheese products to market. Canadian government grants from the Dairy Processing Investment Fund are permitting the company to install robotic equipment and expand ripening rooms to maintain high cheese quality while increasing overall production. This will help meet the growing demand for local cheese, compete better with European selections, and contribute to the growth of the regional economy. The Dairy Processing Investment Fund (DPIF) is a government funding program established to enhance the competitiveness of dairy processors across Canada. It offsets a portion of dairy processing equipment costs and enables more processors to access consultants and other expertise needed to make significant capital investments. Through the Dairy Processing Investment Fund, eligible applicants can receive up to $10 million in agriculture funding for dairy processing equipment. DPIF has a continuous intake of funding applications until March 31, 2021 or until funding has been fully allocated. 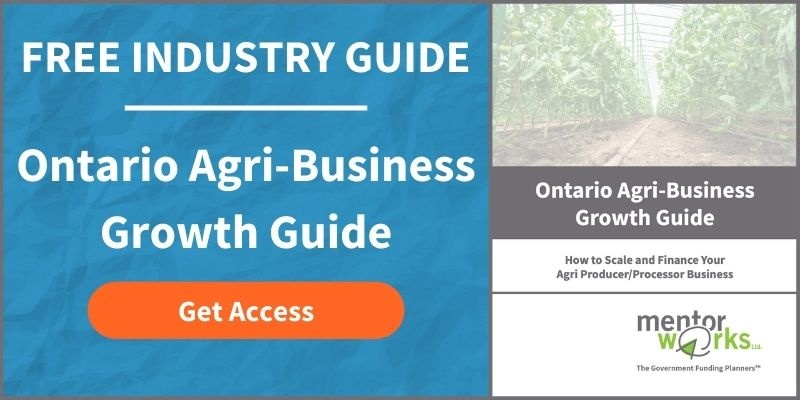 Individuals interested in learning how to manage, grow, and finance their Canadian agriculture business are encouraged to download Mentor Works’ Canadian Agri-Business Growth Guide.